Each summer, CHA takes several summer mission trips. This year is no exception. Several CHA students and faculty will go to Mexico, Honduras, Kentucky, and Wales. Last week in the elementary chapel, Mr. Ralph Bullard shared the story of The Nickel that Laughed by Muriel Taylor. It is a story about how one nickel when shared for missions can impact the world. For several years, Mr. Ralph Bullard has worked with the elementary leadership program, REACH, to kick off the elementary mission emphasis. Each class is given a tub to collect money. Mr. Bullard gave every class a nickel and a crisp, brand, new dollar bill to start their buckets. What we invest in reveals what we treasure. As parents, your investment in your student’s education is a precious treasure. As my children grow older, the dividends from their time at CHA continue to pay a great reward. Time spent reading the Scriptures and praying with your children are also investments that God promises will reap a bountiful reward. How are you eternally investing in your family, your church and your community? Where is your treasure? I am so grateful for the families and companies who have invested in this year’s Heritage Banquet. 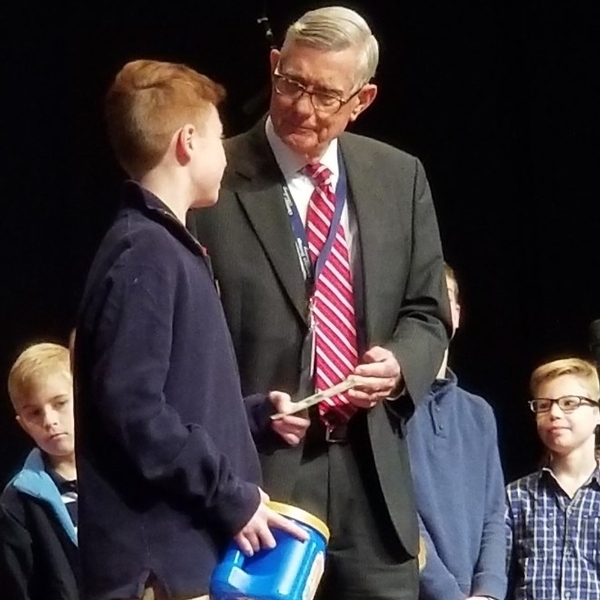 Their investment enables the gifts from that evening to go toward the internal needs of the school such as technology, STEM, elementary playground upgrades and teacher grants. The goal for the evening is $100,000. These investments are not just financial support. These families and companies have chosen to partner with CHA in its Gospel-centered mission. Likewise, the banquet is not just a fundraiser. This banquet is CHA’s largest school-wide event which highlights the mission and vision of our school. We are praying that God will bring over 500 people to this year’s event. The banquet emphasizes the eternal investment that CHA is making in the lives of students every day and our impact on the community and around the globe. How will you spend your evening on February 19? Have you registered for the banquet? Current families and alumni will be encouraged to hear from CHA student leaders and be challenged from Dr. Everett Piper, Oklahoma Wesleyan University’s President. If you know a prospective family who would like to learn more about this investment in kingdom education, please invite them. Prospective families are free. Tickets are $35. Table sponsorships and online registration is available here. I am so grateful that God continues to invest in the work at CHA. He is our ultimate treasure. Please pray that He is magnified greatly through the Heritage Banquet and in the lives of our faculty, staff, and families at CHA.